Alibaba scored another blockbuster Singles’ Day after customers around the world shopped in stores and online on the tenth edition of its November 11 shopping festival. That puts this year’s gross merchandise volume – a measure for the dollar value of total transactions – at a staggering $30.8 billion, although the company recorded its lowest-ever annual growth rate for the event. The figure makes the spending bonanza more than twice the size of Cyber Monday and Black Friday combined in 2017. This is by far the largest-ever Singles’ Day to date. Just 15 hours and 49 minutes into the spending spree, transactions leapfrogged that of 2017’s tally of $25 billion, the company announced on Twitter. As the world anticipates when the supercharged shopping day will hit a ceiling, sales are already cooling. The final total of 2018 represents a 27 percent increase from last year. That’s the lowest Alibaba has seen in the history of Singles’ Day sales, and a drop from 36 percent in 2017 — still, it remains impressive given how large the target is each year. 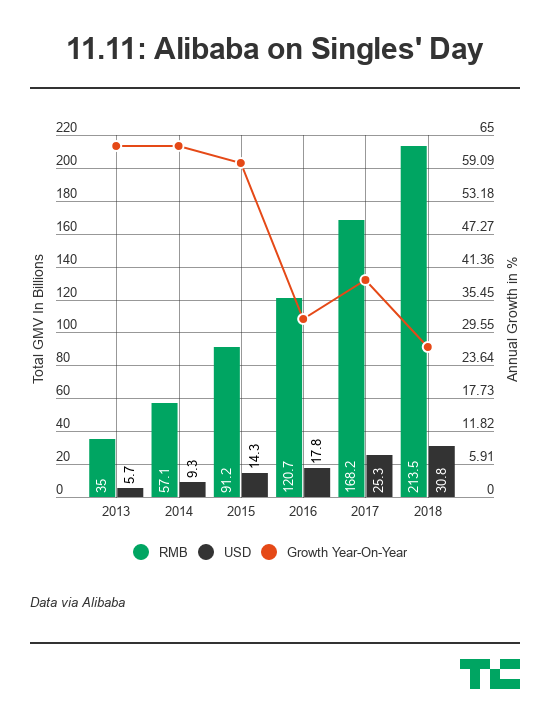 The slowdown came on the heels of Alibaba’s weakest revenue growth since seven quarters ago and a cut in annual revenue forecast – though revenues were still increasing at a healthy rate of 54 percent year-over-year in its latest quarter. Consumers are expected to tighten their purse strings as an economic downturn hits China. The ecommerce giant is, however, unconcerned for it’s betting on the country’s rising middle class in the long run. More than 300 million of China’s 1.4 billion people have entered the middle-income bracket, according to the national statistics bureau. That means discretionary items will drive much of the growth in the Chinese retail titan – and the upmarket trend is already underway. Health supplements, small home appliances, and skincare items are among the fastest growing categories by GMV during Singles’ Day this year. Alibaba has also tapped into physical stores. 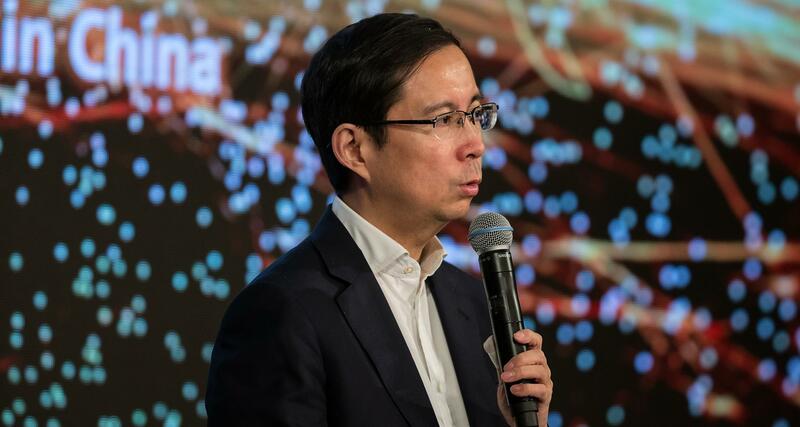 The online retailer is poised to “digitize the whole consumer retail market,” Daniel Zhang, current CEO and incoming chairman as Jack Ma hands over the helm next year, told media on Sunday. Over the past two years, Alibaba has been jostling with close rival JD.com to snap up strategic partnerships with brick-and-mortar retailers who remain keen to reach Chinese consumers. There are nuances in the sheer size of GMV, however, as it doesn’t reflect final revenues. A slew of factors could boost the figure. For one, refunds cannot be processed on November 11. Many vendors run pre-sales weeks in advance, taking deposits for items at the time but only processing full payments on Singles’ Day. Alibaba also aired a star-studded gala on the night of November 10 to drum up sales. It said that over 240 million people – that’s almost one in five people in China – watched the show and its Singles’ Day commercials through two of China’s top TV broadcasters and Alibaba’s own Youku video streaming site. As Alibaba enters its 19th year, it’s turning to new channels to sell. “Voice will be an important entry point,” said Zhang. The firm’s efforts to brace for China’s transition from a mobile-first age into an AI-powered one include a tie-up with voice assistant startup Rokid. Alibaba also has its sights set on international consumers. This year, merchants from over 200 countries participated in Singles’ Day, including those on Alibaba’s Southeast Asia-based Lazada platform. “From day one, our dream was to create a global shopping day,” suggested Zhang. Alibaba celebrated another big milestone this year: over one billion packages were shipped throughout the shopping day. But the company is also under mounting pressure to address its packaging waste problem. “We have to redefine packaging,” said Zhang. That means more than using recycled material. More important, the CEO wants items to travel at a closer distance. This is made possible by algorithms that optimize inventory management. Alibaba could also lean on Ele.me, which it acquired this year and runs a fleet of food delivery staff, to process neighborhood orders which may require less or no packaging at all. Singles’ Day was first popularized as an antidote to Valentines’ Day for the way the date is written numerically: 11.11, which represents four single people. 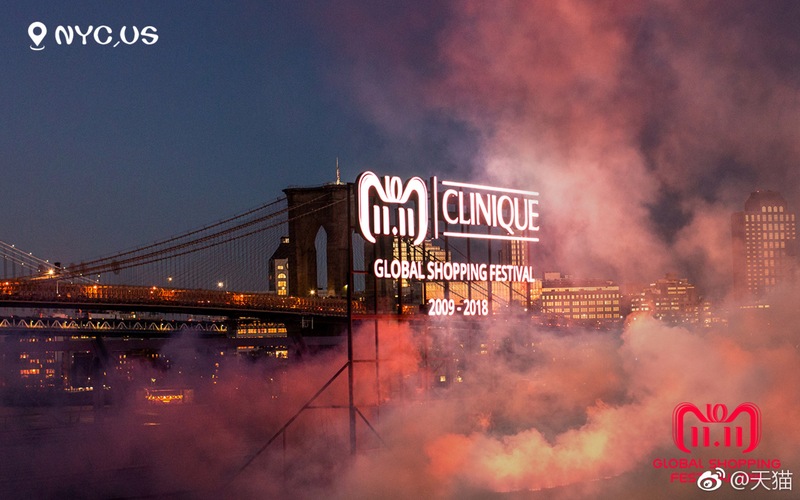 Nearly a decade after Zhang first turned it into a sales promotion for Tmall, Alibaba’s online sales platform for brands, the one-day event has swollen into the world’s largest online shopping festival. “We created this day for people who are lonely. Today, we totally redefined the day for how people shop,” concluded Zhang. For a brief history on the world’s largest online shopping day, see below.